As a part of a broader strategy to fend of increasing competition from non-product traditional sources and relegation to utility status, telecommunication Service Providers are focused on transforming into software and digital business/services organizations. In order to achieve this lofty goal, the network needs to become more agile, simple, flexible and cost-effective, all ...while shortening innovation cycles and new service deployment—from months to moments. Software-defied networking (SDN) and network function virtualization (NFV) promise to revolutionize the industry, but proprietary solutions, legacy business models to protect, and a lack of open interoperability threaten their transformative nature. Key to enabling this transformation are the investments that both Service Providers and ecosystem participants are making to efficiently and effectively accelerate SDN and NFV adoption. In this fast-moving and dynamic environment, some common questions arise. Which initiatives or investments should the Service Providers make in the medium term (2015–2020) to realize the promise of SDN and NFV? What are the hurdles to adoption that can be planned for? How will the Service Providers and supplier ecosystem evolve? How does my progress compare to that of my peers? 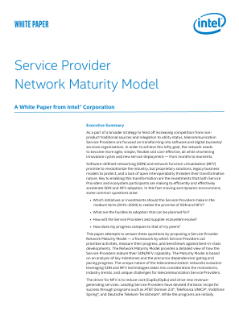 This paper attempts to answer these questions by proposing a Service Provider Network Maturity Model—a framework by which Service Providers can prioritize activities, measure their progress, and benchmark against best-in-class developments. The Network Maturity Model provides a detailed view of how the Service Providers mature their SDN/NFV capability. The Maturity Model is based on an analysis of key milestones and the precursor dependencies' gating and pacing progress. The unique nature of the telecommunication networks evolution leveraging SDN and NFV technologies takes into consideration the motivations, industry trends, and unique challenges for telecommunication Service Providers.